Recently, the program completed MDA in the Carrefour commune, located at western end of the Port-au-Prince metropolitan area. More than 1,000 students at JUVENAT School, a private school in the region, were among those who received a combination of two drugs designed to treat the parasitic worm that causes lymphatic filariasis. The MDA site at the school was one of almost 500 such sites across the commune, about 20 percent of which were at schools, and each of which was expected to treat about 1,000 individuals during the four-day period. The Haitian Ministry of Health, with support from Notre Dame and its partner, the Centers for Disease Control and Prevention, was responsible for MDA in the Port-au-Prince metropolitan area, as well as the Central Plateau and four other provinces, with close to 50 percent of the Haitian population being potential beneficiaries of the treatments sponsored by Notre Dame benefactors in 2014. A rapidly growing salt business, Bon Sel Dayiti, that provides the Haitian population for the first time with clean salt that is co-fortified with diethylcarbamazine to combat lymphatic filariasis and with potassium iodate to address iodine deficiency disorder. A robust monitoring and evaluation program, led by lead researcher Father Streit, addressing the progress of both MDA and salt in eliminating lymphatic filariasis. A clinical partnership with a local hospital in the Léogâne area, about 20 miles west of Port-au-Prince, where the prevalence of lymphatic filariasis has been the highest and where wound care and psychosocial counseling help those afflicted with the disfiguring disease to regain their self-esteem, adapt to their physical challenges and remain productive members of the local community. Continued advocacy to eliminate this and other neglected tropical diseases, possible only through the partnerships and the benevolence of the Notre Dame family. Earl Carter, managing director of the Notre Dame Haiti Program, attributed the program’s success to Father Streit’s unwavering vision and the generosity and compassion of others. “We have been tremendously blessed these past years; corporations and foundations have stepped up, starting with the Bill & Melinda Gates Foundation in 1999 and continuing with many others, who hand-in-hand with the extremely generous Notre Dame family have had a heart for helping the people of Haiti meet a significant problem head-on. By God’s grace, and through the sustained generosity of our partners and friends, we will be able to continue to partner in the fight to eliminate lymphatic filariasis, and meet the needs of those affected by the disease,” said Carter. This year’s MDA efforts, overseen by the Notre Dame Haiti Program, are made possible by the generous support of the Abbvie Foundation, the Centers for Disease Control and Prevention, Inter-American Development Bank, an anonymous philanthropic organization and the gifts of many other friends of the Notre Dame family. 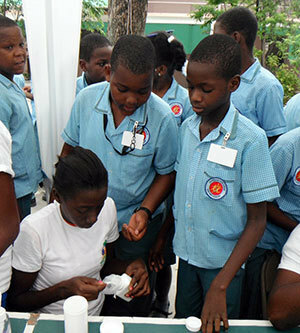 Photo: Children at JUVENAT School in Haiti receive their annual medication from the Notre Dame Haiti Program to prevent lymphatic filariasis. Originally published by Marissa Gebhard at news.nd.edu on June 18, 2014.